The Indian festival of lights kicks off on November 13. It’s one of the highlights of the year for young visitors to the Ryan Education Center at the Art Institute of Chicago: Some time between mid-October and mid-December, kids get to tear up pieces of colored paper to their hearts’ content, then throw them all on the ground. But this isn’t just a confetti free-for-all. 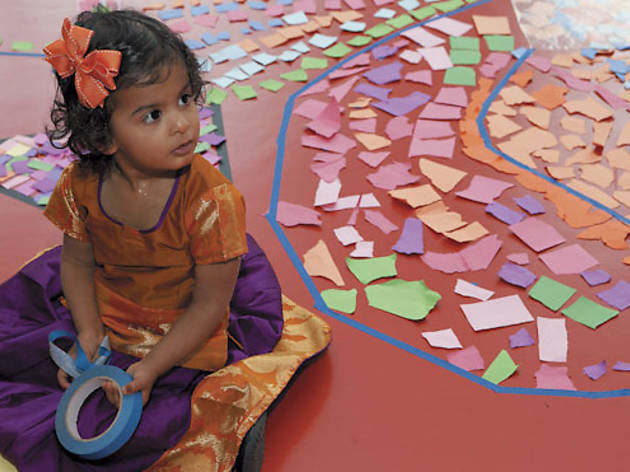 It’s how the center gets kids to make rangoli: temporary, round works of Indian folk art built on the floor as a communal work of art. 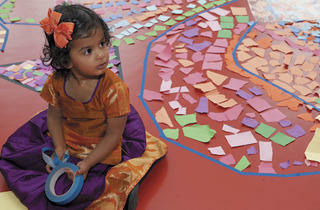 Instead of using traditional colored rice or sand, the Art Institute uses the paper, letting kids do the tearing. The giant group project is part of the Art Institute’s annual Diwali Family Festival (check out a time lapse of the 2009 rangoli at tinyurl.com/tockdiwali). This year, the museum’s kid-centric event kicks off the Indian festival of lights on November 10 (10:30am–3pm). Diwali is a five-day holiday based on the lunar calendar, so the date changes annually. This year it starts on Tuesday, November 13, although there are celebrations both before and after. The festival is observed by Hindus, Sikhs, Jains and other Southeast Asian cultures as a holiday of forgiveness and thanksgiving marking the time of Lord Rama’s return from exile and the start of a new calendar year. The word “Diwali” loosely translated means “row of lamps,” and it’s traditional to light small oil lamps to signify the triumph of good over evil. Firecracker ceremonies drive away evil spirits, people wear new clothes and share sweets with family and friends. For many, Diwali is celebrated at home, but Susan Kuliak, interim Trott family director of interpretive exhibitions and family programs at the Art Institute, says the museum’s event has given people an opportunity to invite friends and family out. “We have a wonderful Southeast Asian collection and we wanted people to come see it,” Kuliak says of one of the reasons the Art Institute started the festival. Over the course of the event, the museum gets between 600 and 800 festivalgoers, but because activities are spread throughout the education center and museum, Kuliak says it never feels crowded. Rockefeller Memorial Chapel, University of Chicago (5850 S Woodlawn Ave, 773-702-2100). Nov 11, 8 pm, free. This event, presented by the school’s Spiritual Life Office, the Hindu Student Sangam and the South Asian Students Association, includes traditional food, dance and music for all ages. Hindu Temple of Greater Chicago (10915 Lemont Rd, Lemont, 630-972-0300). Nov 17. A traditional fireworks display is planned at dusk. Museum of Science and Industry (57th St and Lake Shore Drive, 773 684-1414). The MSI includes Diwali in its “Christmas Around the World” event. See Calendar for details.